Finally, there is a curing light for all applications! 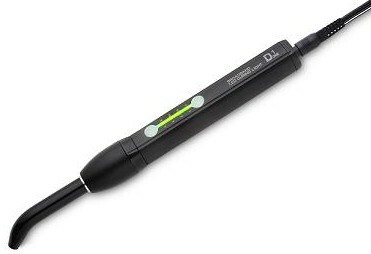 The incredibly powerful D1 Cordless Broadband LED Curing Light generates a light intensity of 3000 mW/cm2 to ensure fast, thorough curing of every light-cured material in as little as one second in plasma emulation mode. The high- power mode provides effective curing of light-cured cements through indirect restorations. Emits a wide spectrum of light ranging from 395 to 480nm to cure all resins. Offers four versatile curing modes: Plasma Emulation (1-4 sec. ), High Power (5 and 10 sec. ), Glass Ionomer (30 sec.) and Bleaching (250 sec.). Five premium LEDs work simultaneously to ensure consistent power output. Removable, autoclavable "turbo" fiber-optic light guide tapers from 11mm to 8mm to concentrate power. Slim, lightweight unit weighs only 4.6 oz. and measures 9 1/4" long including tip. Industrial-grade matte black aluminum body ensures durability and excellent heat dissipation.